On Funk Flex’s Hot 97 show. 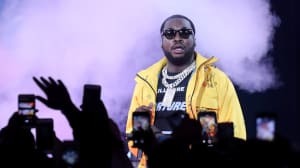 Meek Mill was a guest on Funk Flex's radio show on Tuesday, underlining his current triumphant career moment by freestyling over Drake's diss track, "Back To Back." The original, released in 2015, was released by Drake during a beef between the pair that most considered to be a loss for Meek. Meek Mill released new album Championships on November 30. The album features appearances from Drake, Cardi B, Jay-Z, and more.